Alexandria Attractions - More Than Just Alexandria Library! "...There are enough Alexandria attractions to keep you off the ship for the whole day or two of your stay!" It's funny to think that, had it not been destroyed in wars, riots, earthquakes and sieges, Alexandria would have been a tourist attraction bigger than Athens or Rome! NOTE: There are a few different ways you can go around sightseeing Alexandria attractions, but the one we absolutely do not recommend is getting off the ship, exiting the Alexandria port area and trying to walk around on your own. All Alexandria sights to see are too spread out and you won't get to see anything. The best way to see Alexandria attractions are: taking one of the cruise organized shore excursions, booking a private tour online or taking one of the Alexandria taxi cars, if you're more of an adventurous type! Hardly any Alexandria attractions from old times are still standing to this day, but with those few that do and a little bit of imagination, it will be easy to imagine the grandeur of the once biggest Hellenistic center, ancient Alexandria! If you came to Alexandria 2000 years ago, you would literally have been blinded by the amount of marble that clad Alexandria's streets; you would have been stunned by the amount of theatres, temples and baths it had. 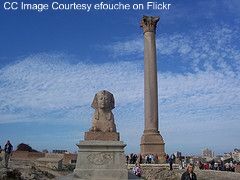 What were some of the most famous Alexandria attractions in the Past? The Mouseion with its lecture halls, laboratories, observatories, a zoo, a park and the famous Alexandria library. Soma, Alexander's Mausoleum - the burial place of the legendary Alexander the Great is somewhat of a mystery...it stood at the crossroads of the two main streets of Alexandria, close to today's mosque Nebi Daniel, and then suddenly dissapeared in the 4th century. You can read more about it in our article Alexander the Great History and Myth. The temple of Serapis, built by the Ptolemies on the acropolis of Alexandria. Not much is left from this structure today, but its position is marked with Pompeii's pillar. What Alexandria attractions can still be seen today? Catacombs of Kom el Shoqafa are a necropolis that consists of a series of underground tombs, considered one of the Seven Wonders of the Middle Ages. Read more in our article Catacombs of Kom el Shoqafa. Bibliotheca Alexandrina or the New Library of Alexandria, is an impressive new edifice housing more than just a library. Read more about the newest one of the Alexandria attractions in our article Bibliotheca Alexandrina. 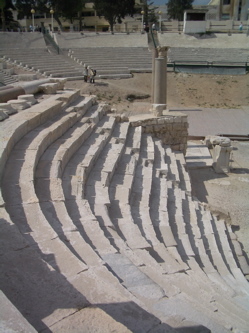 The Roman Amphitheatre is actually more of an Odeon, or a small theatre - it could seat up to 800 spectators, which is small compared to the other theatres around the Roman Empire. It is located right downtown Alexandria, about 10-15 minutes ride from Alexandria port. Alexandria Museums - although the famous Greco-Roman theatre is currently closed for restoration, you won't be disappointed with the National Museum of Alexandria and the museums inside the Bibliotheca Alexandrina. Read more in our article Alexandria Museums. Montaza (Montazah) Palace is the Royal Palace of Alexandria, built at the end of the 19th century. It is one of the Alexandria attactions that taxi drivers love to take you to as it's on the outskirts of the city. Read more in our article Montaza Palace. Pompeii's Pillar is a solitary pillar standing up on the site of the ancient Serapeum. When the Cruisaders came to Alexandria in the 15th century, they found a pillar and called it Pompeii's pillar, although it had nothing to do with him. It is actually one of the pillars that belonged to the Serapeum, 84 feet high and 7 feet thick, built of red granite of Assuan. It is supposedly the largest pillar in the world made out of one single piece of marble. This pillar was most probably erected as a monumental column to Diocletian in the 3rd century AD, who had crushed a rebellion here. Pompeii's pillar just a minutes ride from the Catacombs of Kom el Shoqafa so make sure you tell your taxi driver to stop by! Quaitbai fort is a fortress situated on the spot where once the famous Pharos lighthouse stood. This structure, built in the 15th century, now houses a Naval Museum. When it was first built, by Sultan Kait Buy, it served as a fortification against the Turks. Alexandria Churches and Mosques - Alexandria has always been a place where different religions have been practiced simultaneously, so besides Islamic mosques you will also see Catholic, Greek Orthodox, Coptic and Protestant Churches, as well as Jewish Synagogues. 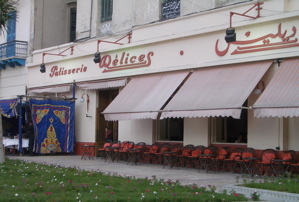 Historical Alexandria Cafes and Hotels - Visiting historical Alexandria cafes and hotels is one of the ways to get a glimpse of the Cosmopolitan era in Alexandrian history, at the beginning of the 20th century. Places like Pastroudis (unfortunately recently closed), Baudrot, Patisserie Delices, Trianon and Hotel Cecil were frequented by Lawrence Durrell, E.M. Forster, Cavafy and their contemporaries and still stand there for you to visit. Alexandria is quite spread out and considering it's almost impossible to find people who speak English, it can be quite a challenge to explore it on your own. That's why you seriously consider taking one of the tours easily booked online.